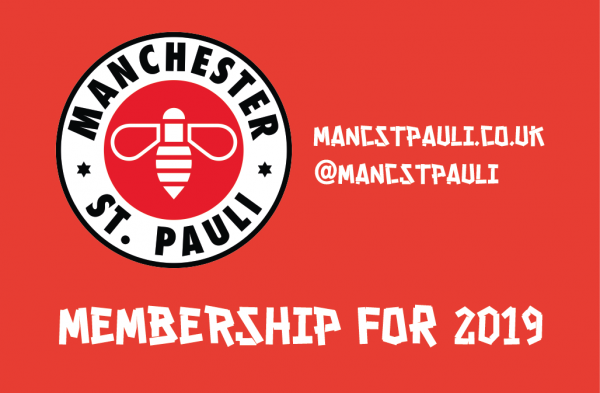 2019 Membership to Manchester St. Pauli. Where does your £5 go? £2 of it goes directly to our chosen charities for the year, with the remainder going towards our running costs: processing membership applications, our subscription to the club so we are an official supporters group, running the website, printing new merchandise, etc. Membership is optional and you don’t have to be a member to attend our screenings, or any other events we may organise, but if you can afford to join you’d be donating a couple of quid to a good cause while also helping us with our running costs. Your membership card and sticker will be posted to you within 5-10 working days. Your 10% discount code will be sent to the email address used during checkout within 5 working days [Please check your Spam Folders as our automated mail service can end up in there]. Please note that all members must agree with, and adhere to our constitution. If you have any questions about membership, please contact us via email at hello@mancstpauli.co.uk, or via Facebook or Twitter.